Montenegro has two international airports, one approx 11km from the capital Podgorica and another near Tivat on the coast. Podgorica Airport (IATA: TGD, ICAO: LYPG) is an international airport located 11 km (6.8 mi) south of Podgorica, Montenegro. It is the main hub for Montenegro Airlines. It is one of two public airports in Montenegro, the other being Tivat Airport. Both are operated by the state-owned company Airports of Montenegro (Аеродроми Црне Горе, Aerodromi Crne Gore). The airport is sometimes called Golubovci Airport by the locals, as the town of Golubovci is in close proximity. Airports Council International awarded Podgorica the best airport under 1 million passengers in 2007. The IATA code of the airport is still TGD because Podgorica was named Titograd (after Josip Broz Tito) from 1946 to 1992, during which time the airport opened. The airport handles domestic flights within Montenegro as well as international flights. As Montenegro’s two main airports are merely 80 km apart, there are no regular passenger domestic flights. Domestic flights have been reduced to charter flights and general aviation, and all scheduled traffic is international. There are daily scheduled flights to various European destinations. During the summer season, there are many charter flights and air connections to various major cities in the world. The flight to Belgrade airport has traditionally accounted for majority of the traffic at the airport, but the percentage is decreasing. VIP and taxi airlines Vektra Aviation, Di Air and OKI Air are based at the airport. Serbian VIP airlines Air Pink and Prince Aviation also use the airport. 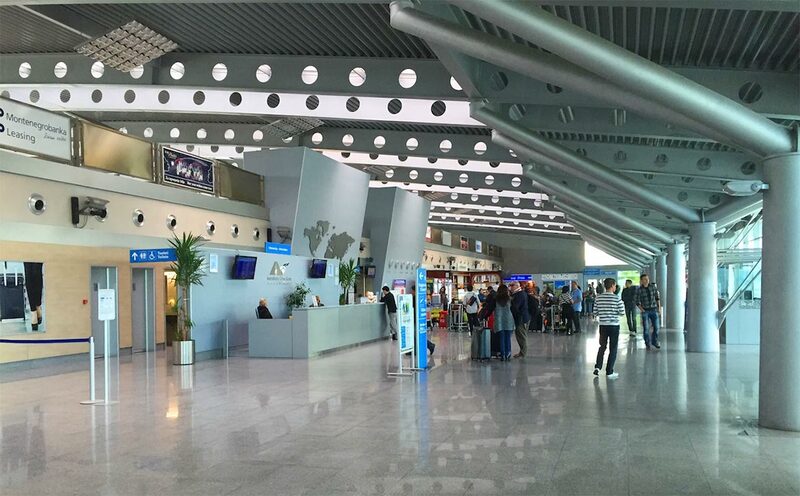 As air traffic in Montenegro saw a rapid increase in recent years, the now called “old” passenger terminal, a small, single-story building, with one international and one domestic departure gate, has become inadequate. This led to the construction of an entirely new terminal. The new passenger terminal (5,500 m²) opened on May 14, 2006. It has eight departure and two arrival gates, and is able to handle up to 1 million passengers annually. The main terminal building is a modern aluminium and glass structure, featuring advanced architectural solutions such as indirect lighting throughout the building. Since its opening, it features Costa Coffee outlet, two newspaper stalls, a duty-free shop, rent-a-car posts, and CKB bank outlet. Although the airport is considered a low-risk one, security screening has been visibly increased since the introduction of the new terminal. Security measures and monitoring that are standard for European airports are applied on the terminal. Although a completely new building, it does not feature jetways, as passenger flow at the airport does not impose the need for ones. The old terminal building is now housing medical staff, the Airports of Montenegro school center, lost-and-found luggage, airlines offices, a VIP lounge and a press conference hall. It was completely renovated and opened on September 15, 2009 and is now intended for VIP use and general aviation. Podgorica Airport is accessible by Podgorica – Bar road (E65/E80), via short detour. Stretch of this road, from Podgorica to the airport, has been upgraded to expressway standard. Drive from the city center to the airport usually takes less than 15 minutes. With the construction of Sozina tunnel, the airport is some 40 km away from Bar, Montenegro’s main port, and so airport increasingly caters to needs of cities on southern part of Montenegin coast. Public transportation to and from airport is covered by buses and taxis. Podgorica airport is Montenegro’s main international airport. It is situated 12km (7.5 miles) south of Podgorica. It is a hub for Montenegro’s national airline carrier, Montenegro Airlines. One can get from the airport to Podgorica center by taking the minibus, which usually waits in front of the terminal. The taxi to the center will be more expensive, usually at €15. From the city center (Republic Place) to the Airport, metered Taxi costs 5-6 Euros. One thing to notice about Podgorica airport is the lack of bus service to the coast. Hence, as soon as you exit the terminal, you will be surrounded by guys asking if you want a taxi. At this point, they are competing to see how much they can squeeze you for. Montenegro is most definitely not a cheap country, but still, keep your wits about you. Hotels in Kotor will offer airport transfer for approx 70-80 euros, so don’t listen to guys quoting 120 euro or more for the drive to the coast. Tivat Airport (IATA: TIV, ICAO: LYTV) is an international airport located 4 km (2.5 mi) from the center of Tivat, Montenegro. As Montenegro’s two main airports are merely 80 km apart, there are no regular passenger domestic flights. It is the busier of two international airports in Montenegro, the other being Podgorica Airport. Traffic at the airport follows the highly seasonal nature of the tourism industry in coastal Montenegro, with 80% of the total volume of passengers being handled during the peak season (May–September). It has been one of the fastest growing airports in the region, doubling passenger flow in the 2006 – 2016 period. Tivat Airport is assigned 4D classification by ICAO, as it is one of the most difficult international airports to land at due to its location of the Boka Kotorska (Bay of Kotor). Tivat Airport is situated just beside Tivat city, on the coast of Adriatic sea, and about 20 km north-west of Budva city one of the most popular tourist center in this part of Adriatic. Passengers are awarded spectacular views of the bay, the surrounding mountains and a low flyby over Porto Montenegro luxury yacht marina. The airport is also popular among plane spotters, as end of the runway is easily accessible and offers unobstructed views of takeoffs and landings, with a scenic mountain backdrop. Year-round services from the airport include Belgrade and Moscow. Dubrovnik airport in Croatia is a half hour drive from the Montenegro border and the coastal city of Herceg-Novi, and is served by many major airlines, so it might be a good option for tourists coming by plane.